If you’re a fan of colour and print, you’ve no doubt heard of – or worn – Melbourne label, Mister Zimi. Like many, I first chanced upon Mister Zimi on a holiday to Bali where I stumbled upon their store and went cray cray over their outrageously gorgeous and colourful frockery and flatteringly fabulous shapes and styles. Everything about this label, from the warm hues and textured decor of their stores through to their floaty maxis and shorter shifts suggested to me a colourful, fun and relaxed approach to Summer which I for one wholeheartedly embrace. While I love to pack my Zimi for holidays, it’s also a look that has happily translated to my suburban context too. When the time came for Mister Zimi to close their Bali doors – Hashtag Devo – I was fortunate enough to be able to visit one of their bricks and mortar stores here in Melbourne (there are two stores here and they’ve since opened in BrisVegas and Bondi in addition to Byron Bay), and I’ve also shopped quite a bit online. I generally go in store as soon as a collection has landed and try on All The Things to work out what shapes and styles suit as they vary from collection to collection. I also like to see the prints up close as I often find what suits me is different to what I can be initially drawn to. Due to it’s enormous popularity and demand, Mister Zimi now has four smaller collections each year instead of the previous two Summer and Winter ranges. This means more Mister Zimi and more choice although it’s not hard to get bamboozled by all the prints and styles available. I also know, from the many questions I get asked on Instagram whenever I wear Mister Zimi, that many of you are shopping online only and would appreciate some intel on the sizing and fit of the current range. 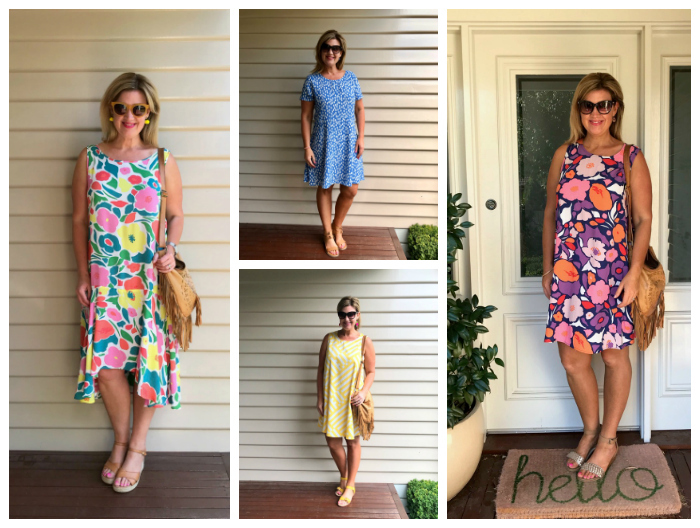 So with that in mind, in today’s post I’m sharing and wearing, ahem, a few frocks from the last two collections – La Dolce Vita and Santorini – to help you shop online. I should also say that I have found that for me, generally speaking, the dresses are much more flattering and despite my love of the soft pant and jumpsuit, I couldn’t find anything that suited me anyway near as much as the frockery in the current Mister Zimi range. I also tend to prefer a dress over a top as it’s a complete outfit in Summer. 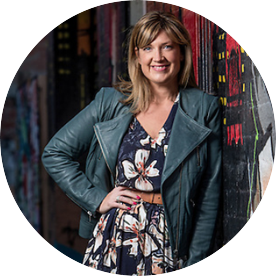 Also, before we start, to give you an idea of how the following styles might fit you, I’m 175cm/5’9″ tall and usually a size 12/14 in brands like Gorman, Seed Heritage, Witchery and Country Road. I’m an hourglass/curvy girl too and have a 14DD/E bust, so generally wear a size Large in tops for a comfortable fit. This was the style I was most excited about in the Santorini collection. The Lily dress is a relaxed swing dress with a drop waist, a full skirt featuring a high low hemline. It’s made from 100% Viscose and is machine washable too. 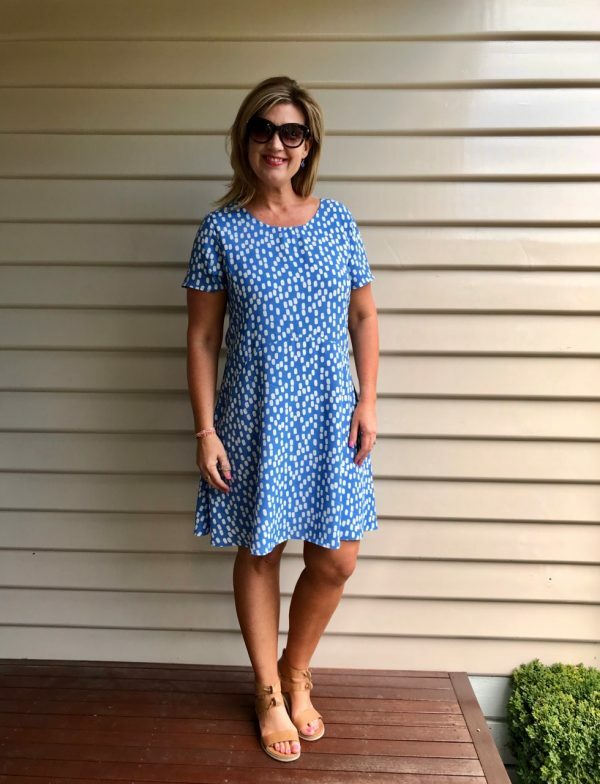 Having bought this style in a different print last summer, I knew this longer style dress would be a winner on me once I worked out the size – last year’s was a bit big on me but I wasn’t sure how the cuts would compare. I initially ordered both a size 12 and 14 but the 12 was by far the better fit, and is still roomy enough to drape and not cling which is a must for me in hot weather. So if you’re in between sizes, I’d size down. Above, I’m wearing this dress in the Primrose Print in a size 12. I am tempted to order this style in All The Prints. 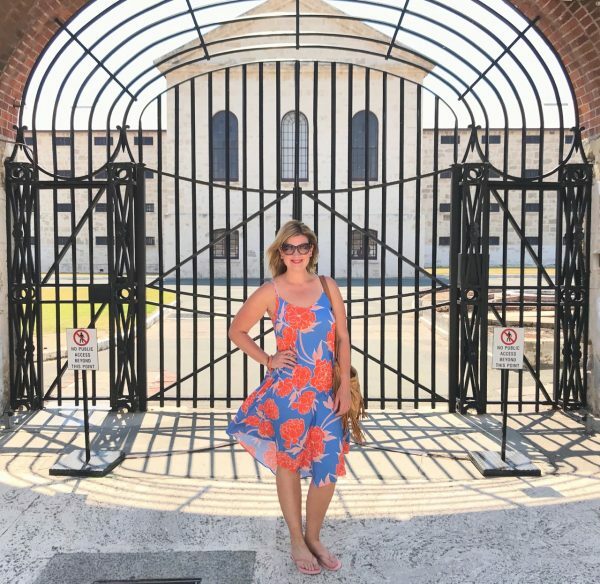 I’ve worn this dress with flat sandals as well as my favourite wedges and I love that it’s such a lovely, bright and summery print. 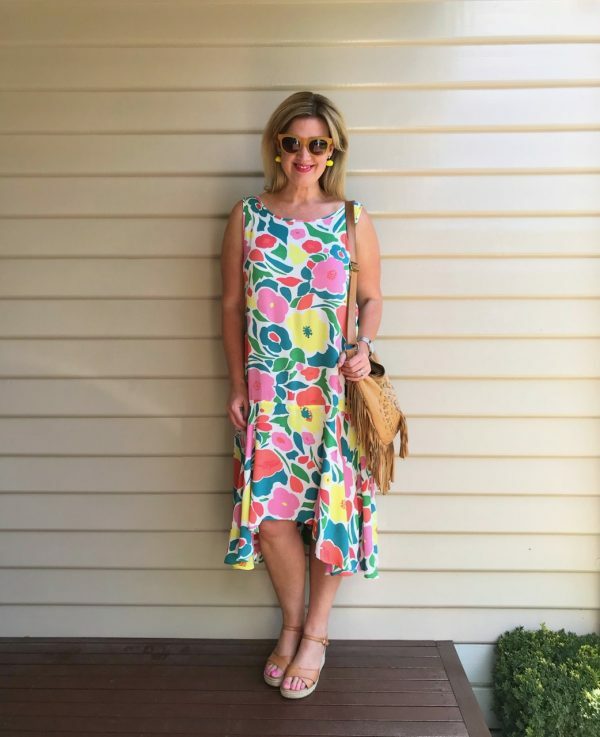 The Tina dress is a long term Mister Zimi favourite – and one of the most popular styles this Summer as well with only a handful of sizes left – but it’s also a style I’ve always shied away from because of the length. I had read though that this year’s sleeveless offering was a bit longer though, so with fingers crossed, I ordered the size 14, hoping it would be a comfortable length on me. My thinking was that if I sized up, I’d get the extra length I need. As it turned out, the 14 is a bit big on me – I could have easily worn the 12 – but I definitely needed the length of the 14. A spray tan always helps too! 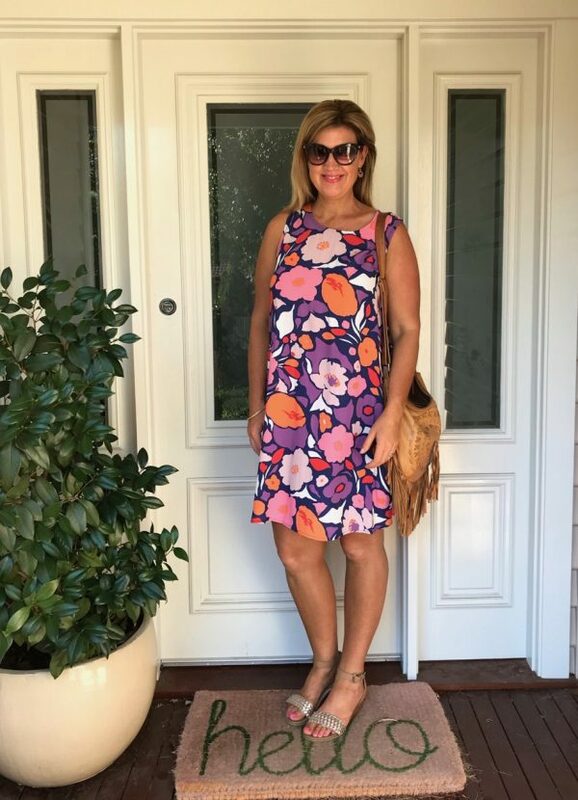 I bought this dress in two prints – the pretty purple and pink floral colourway, Passionflower above, and also the lovely tencel Buttercup Geo, below. Even though the first dress is 100% Viscose and the second is Tencel, the fit is very similar. The Tencel is a slightly heavier weight though of course. Looking at these photos, I’d say the tencel is a fraction shorter too. 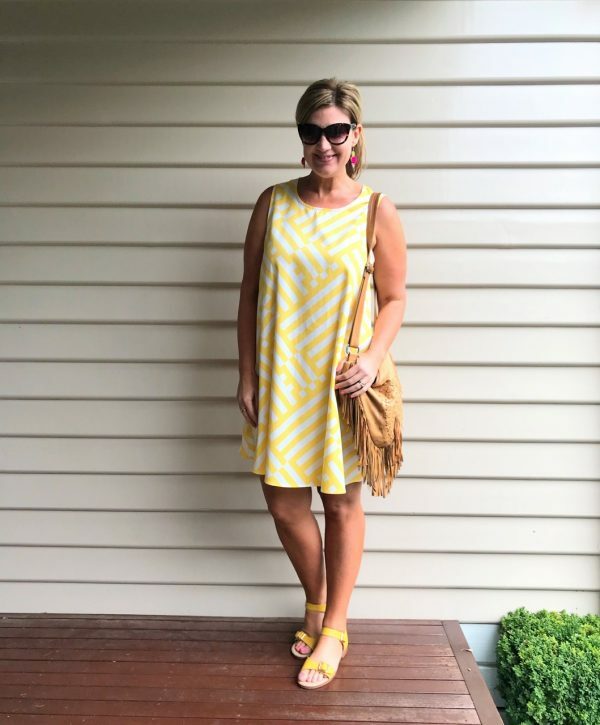 How fab is yellow in Summer? I also tried on but returned the Camilla dress – which is a stunning, tie front style which would look a million bucks on the right person. Sadly on me, with my curves I needed to wear a bra and with the tie front, this was visible and overall, way too booblicious for me. I think it would suit someone who is smaller busted than me – even better if you can get away without a bra altogether or you can tie the straps in a way that covers your bra. I didn’t try on any of the silk styles either – having decided to buy more styles, I went for the less expensive options. None of the pants worked on me either – they were quite low on the waist and too fitted on me. These days I prefer a high waisted culotte or skinny jean situation. I adore this new, longer, off the shoulder style which I’ve worn out for dinner and to a friend’s 40th. It’s basically a slip on, off the shoulder dress with an elastic frill detail with a slight dip at back. It’s also cut on the bias and flares out a bit from waist. It’s been a very popular style this Summer too, with limited sizes available in the florals. At the time of writing this, the full size range is still available in the stripe. 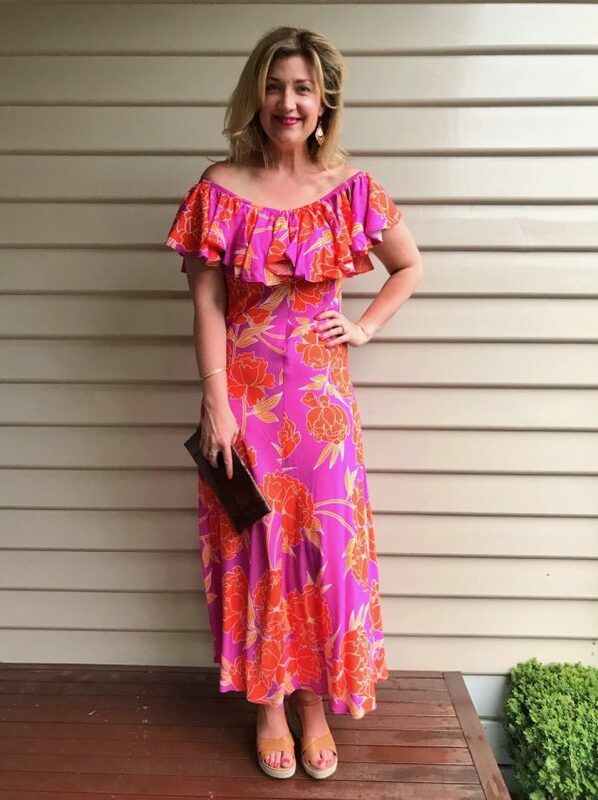 Available in three prints – I’m wearing the Palma print below – it’s made from 100% rayon and so has a less dressy look than the viscose but it’s still soft and easy to wear. It’s a lightweight fabric though and has a cotton feel. I’m wearing size 12 which fits well, although with it’s narrow torso, front seam and bias cut, this is a dress that calls for some supportive foundations, if you know what I mean! I think this dress works on me because I’m tall. I’m not sure how a much shorter person would find this cut in the same size. Again, I’ve worn this with sandals and my favourite wedges and love that the colour really does all the talking. Just add beachy waves and a pair of big earrings for easy summer glam. This such a fun, breezy Summer style that had instant appeal for me in the Cyprus print. It’s a t-shirt style shift dress which features a curved seam detail at the waist which gives it a more tailored shape and flared body. Made from 100% Viscose, this is a lovely style that can be easily dressed up or down, depending on the footwear or accessories. I bought this style in a 14 which is perfect for me, just. I find the sleeves on Mister Zimi tops and dresses on the firmer side – which is why I gravitate to the sleeveless styles. It’s just long enough for me. Again this style has been overwhelmingly popular so very limited sizes remain. The Cyprus print I’m wearing is completely sold out but there are some sizes left in other prints. The Beach Dress is a new style launched as part of the La Dolce Vita collection. Made from 100% rayon, this less expensive and super easy wearing style has now completely sold out in all prints – D’OH. If it is restocked or you find yourself in store or searching second hand sale sites, I found this to be a very oversized style. I initially ordered a 14 which was massive on me and swapped it for a 12. I think I could have even gone down to a 10. If you like a longer length – also check out the Vintage Midi style in this collection. I’m my usual size 12 in this longer, A-line, flared style. As with the Santorini collection, I didn’t try on any of the silk styles but the jumpsuits didn’t do me any favours. I also liked the drop waisted Polly dress but it was not conducive to wearing a bra for me – the arm holes and back were too low. I’ve found, as stated on the bright pink care card you receive with any purchase, that my Viscose styles shrink in the wash – they look quite a bit smaller – one or two sizes in fact. When I called the Mister Zimi customer care line to query this, I was told to iron the dress using a very hot iron and the dress will return to it’s original size. I found this to be true and have even resurrected dresses I thought I could no longer wear. So if you have an old Zimi piece lying around that has “shrunk”, you might like to try and iron it on your highest setting to see if you can revive it. To date, I haven’t had any issues with “shrinkage” with the tencel or rayon styles though. This is not a sponsored post, I’m just a big Mister Zimi fan. I bought all the dresses in this post and don’t get any commission for any sales. This post contains a couple of affiliate links but not for Mister Zimi. You don’t pay any extra and I earn a small commission. Read more in my Disclosure Policy here. Are you a Mister Zimi fan? Have you bought anything before or from the most recent collections? Do you have a question about the current collection? I’ll try to answer everything!